Pope John Paul II died April 2, 2005 in his Vatican apartment at the age of 84. 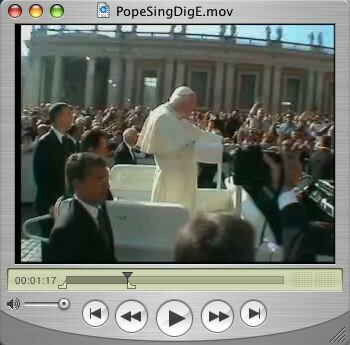 On Wednesday, October 3rd, 2001, the Cold Spring Area Maennerchor Mens' Chorus members attended morning mass at St. Peter's Square and sang for Pope John Paul II. This was part of a 2 week EURO III Maennerchor Tour of Austria, Germany, Hungary, Slovenia and Italy. The tour group included over 90 Minnesotans who ventured across the Atlantic just three weeks after the 9/11 tragedy.